Until I get my knitting mojo back I will be working on two more Scraps Blanket. Like all fiber lovers I have a yarn stash and then a stash full of scraps. Time to put those scraps to use! Recently, I participated in a testing pool group on Ravelry for a pattern for a child’s cat hat. I have always wanted to be a tester so I signed up and got knitting. I liked the pattern so much I made two! Check out my project pages and keep the look out for the published pattern. The Neon Nutkins are done. Woot woot! Method: I used magic loop rather than DPNs. Just make sure when reading the directions you note that needles 1 and 4 are the back/bottom of your sock. 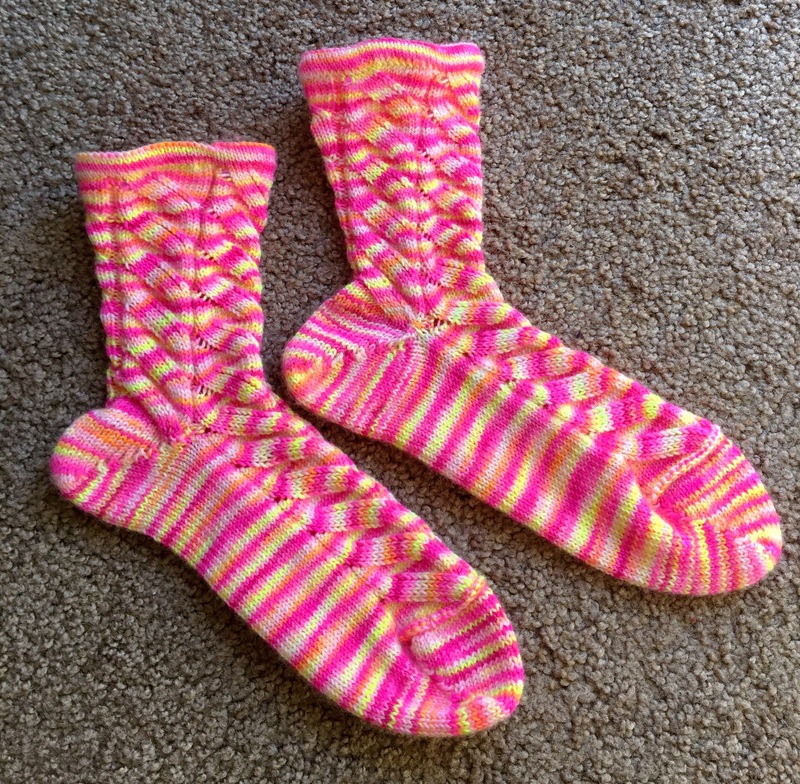 I made these socks one at a time, but it would be possible to make both simultaneously. The pattern was easy to memorize. 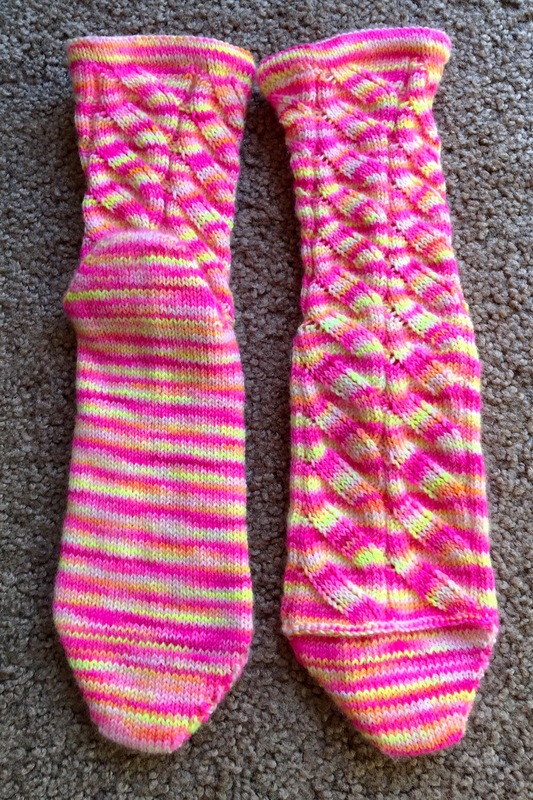 Therefore, these were a pretty quick sock knit. The Short Row Toe. 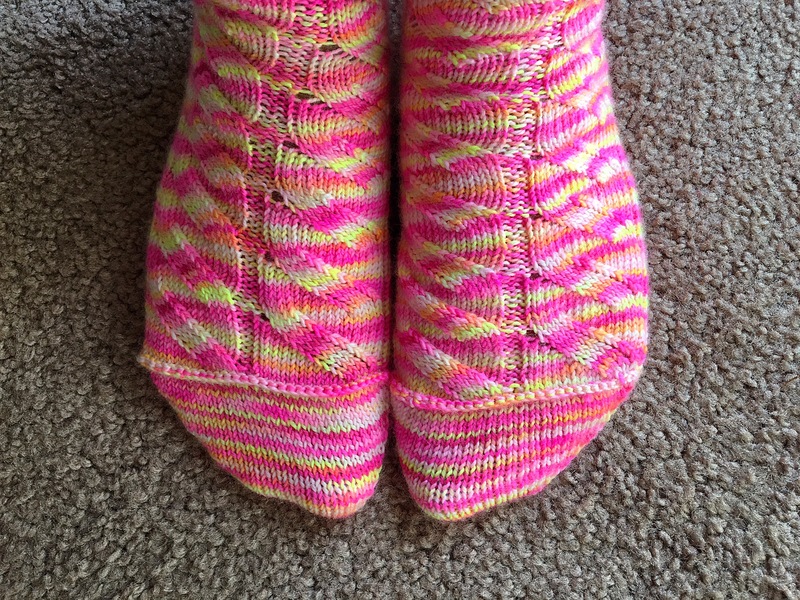 I have never made socks with short row toes and I have to say I like them. I don’t know why I was so intimidated by them before. The directions for the short row heels and toe. The instructions tell you to use a yarn over in the short row shaping rather than wrapping the yarn. I found this to be such a bother and the yarn overs resulted in huge gaps in the heel seam. I ended up frogging the first heel and wrapping the yarn on the short rows. My socks came out a little snug. I did use a half size needle smaller than the pattern called for, however, reading other comments I don’t think I am the only one. Just keep in mind that the pattern is not super stretchy. If you have wide feet please adjust your gauge. So would I make these again? Most certainly. I love my Neon Nutkins! Well it is here! My 3rd Blogging Anniversary. It has been a wonderful experience participating in the blogging community. Not only have I enjoyed writing about my life, but I have had such an amazing time reading others blogs too. In honor of this special day here are my five of my top posts from the past 3 years. Conquering Machu Picchu highlighted my journey on the Inca Trail. To this date it is one of my proudest accomplishments. Lacy Beginnings Scarf is one of my free and original scarf patterns. This pattern is a great way to beginning learning how to make lace- like patterns in knitting. No Stash Girl was a post I wrote to highlight that not every knitter is a borderline hoarder (haha). Yes I love yarn, but no I don’t need 100 skeins tucked away in my closet. This post explains why. Summer Travels: New York City highlights my last trip to New York City. We got to eat well, see a great show, and I got to model one of my Purl Soho knits on the Brooklyn Bridge. Best Buy Ever! This cone of yarn was one of my best purchases ever! I got a great sweater and a beautiful scarf out of it. I kick myself to this day for not buying more cones. Three done and four to go! My zipper pouches for my bridesmaids are slowly being completed. I love how these came out, especially the blue and orange one. The combination of the zipper and beads is a nice color pop.